A few weeks ago at work one of our temps was complaining that he wanted to go home early (and I don't?). Being a little frustrated I said to him, "Let me give you a little advise, never get home early." "Well," I answered. "You'll never walk into something that will surprise you." I got home early last night. And boy was I surprised. Look what I caught my husband doing. Yes, when he got home last night a box with half of our Rejuvenation order was on the porch. He was going to have these up by the time I got home from work to surprise me. 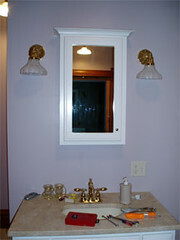 Our master bathroom. Now with this great lighting I have no excuse for looking hideous! The mudroom. We don't really like this light. I'm trying to talk Tim into returning it, but we probably won't. 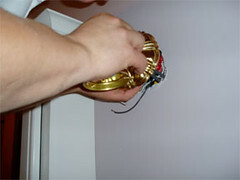 It's just too exciting to have something installed you just can't seem to go backwards. 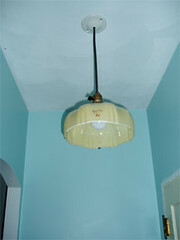 This light is in the hallway to the mudroom (you can see the blue color that I'm currently painting the beadboard). This is one of the first fixtures I ordered for the house. I found it over the internet and loved it so much I had it shipped from Germany. Yes, this light is more worldly than its owners. It is currently the thing I love the most in the house. Ooh, that German light is my favorite one, too. Very nice. I good light fixture really makes a room. The one room I've actually finished is the bathroom. 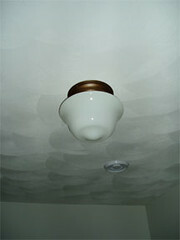 I put in this really nice brass fixture that I got off eaby. I had to clean it up are re-wire it, but ii really makes the room. After I got it up I just stood there an admired it for a while.